We are pleased to share with you a new publication, Fit-For-Purpose Land Administration - Guiding Principles for Country Implementation, published by UN-Habitat/GLTN and Dutch Kadaster. This publication is primarily designed to allow a range of stakeholders in developing countries to understand the overall Fit-For-Purpose approach and to recognize the benefits of adopting this approach. The Fit-for-Purpose solutions provide opportunities for land administration systems to deliver benefits, including secure tenure rights, to a wide range of stakeholders within a relatively short time and for relatively affordable costs in a flexible manner. 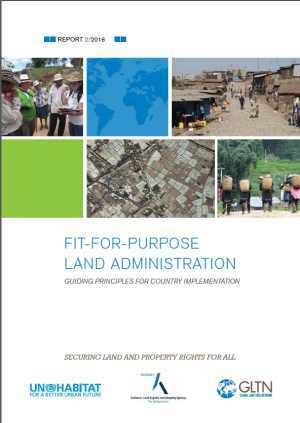 It provides structured guidance on building the spatial, legal and institutional frameworks in support of designing country-specific strategies for implementing FFP land administration. It contains the analysis and operational advisory guidelines to implement the approach. Authors of the Guide are Stig Enemark, Robin McLaren and Christiaan Lemmen.